A personal mission statement is the most powerful tool you can develop in your life. By identifying your single motivating purpose and incorporating it into your philosophy, you will have the tools to achieve happiness and success on a daily basis. 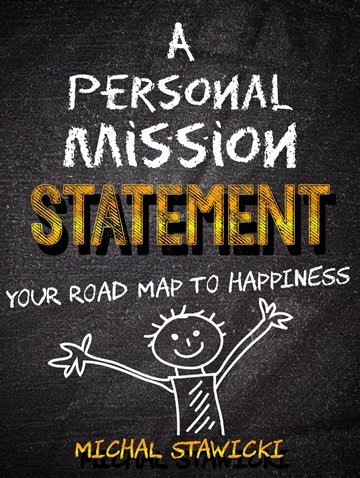 I wrote "A Personal Mission Statement: Your Roadmap to Happiness" to teach you what a personal mission statement is, how to create one and, if you already have one, how to use it effectively. Unsure of what a personal mission statement is? A personal mission statement is a compass to guide your life. Though the terrain of your life can change rapidly, using this compass will ensure you always find happiness and success. I've seen extraordinary changes in my life as a result of following my personal mission statement, and so have many others. You can easily join the ranks of people transforming their lives! There are plenty of resources available online with advice on creating a personal mission statement. In today's world we are overloaded with information, what we need is motivation to actually implement the knowledge we've gained. My book not only shares the "how," but also the "why." Another benefit of my book is that it includes the story of my struggle in crafting my personal mission statement, offering encouragement as you create yours. 6 ways to leverage your personal mission statement - achieve faster results in your life! If you are an advanced student of personal development, you have your goals defined, you know yourself, your weaknesses and strengths, but you may not have formed a personal mission statement yet - this book can still be useful for you. Check out Chapters 4 - "Chiseling your personal mission statement out of raw material," and 5 - "I have it, what's next?" This book can be helpful for you even if you already have a personal mission statement, but are not using it. If you made your statement, but haven't begun using it, check out Chapter 5 - "I have it! What's next?" A personal mission statement is generally written, but if you are more responsive to visual or audio stimuli, I will show how you can use your written mission statement in conjunction with pictures and sounds. 6 ways to put your personal mission statement into use. all in less than 9000 words, so you can begin transforming your life today. Download now and take the first step on your very own road to happiness. Michal Stawicki is a busy, working parent of 3 amazing children and husband to one wonderful woman. Michal is from Poland and grew up under communist rule when opportunity was scarce. His demanding job and long commute had taken its toll. So, Michal decided it was time to change his life, to get healthy physically and financially, to become more connected to his family and spirituality and, most importantly, to follow his passions. Michal is on a mission to help busy, working adults reclaim their time, their spirit and their passions! with my values and ideals, without this awesome little book." found his personal mission statement to be of immense value." really like this author's personal style of writing."